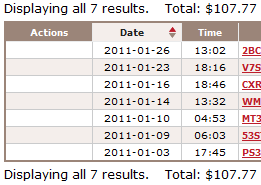 January was a great month, finally definitely was over the $100 a day mark with all my sources of income combined. that I will display under. Theirs also about another $100 from various CPA offers that I am trying out, not too sure on those yet and even in february I am not too confident on which one I want to use going forward I am trying to get into clickbank products more. Also, I did $73 with infolinks which I really like because they pay directly to my paypal account in USD which is really cool for me since I usually have to lose money with the currency exchange to canadian $ all the time when I buy stuff online. I have been trying it on and off on my main website but so far I cannot find a serious change in adsense account. It’s really hard to see a change, all I can see right now is a lower ecmp but the same CTR between weeks where I have infolinks on and off. but by logic, if those people are clicking on infolinks add than that MUST mean less people clicking on adsense right? However it does not seem to be the case so far soooo giving infolinks more tries so far in february, on/off again until I’m convinced it does not affect my adsense income. Testing it on another website too actually who seems to be benefiting really well from it actually. My adsense ecpm always was terrible on that website ($1-5) and infolinks still pulls off another $1-3 ecmp so that’s cool, that website seems more worthwhile now that it makes about $10 a day :). Well that’s january, I know I enjoyed income reports but maybe that was just me. If you guys would like to see some other information ask away in the comments and I might include it in the future reports. that’s awesome, this is from only 3 websites?…. btw could be really cool to see sample of your adsense site, just to see the design etc….even if you’ll hide the niche and everything else ofcourse …. and for a theme sample I mean it’s nothing special.. I use artisteer on these so far and I have a sidebar to the right where I put my pages/post links and google search box for my biggest website. The top is just a normal header. White background as fingerman said in his post. Very odd but I will mention this in my February report but I lost a lot of money switching over my big website to a woo theme… after a few days I lost a LOT of rankings. After switching back to artisteer I’m as strong as I ever been after 2 days. really interesting and I will have to be careful about changing themes again. For now, I made my artister theme on my main website a bit better looking with a menu under the header. this is amazing!!!! im gonna buy Artisteer. do you have a screenshot with any important info blocked out you can show us? What type of info do you want to see? just what one of your websites looks like aesthetically, like a screen shot of the landing page to see colors, where the adsense is placed and stuff, i really have no idea how to go about making the best layout. i also have a question about domain names. lets say your keyword is ‘winter backpacks’ –> would a good domain name be bestwinterbackpackreviews.com? or would that throw search engines off? As for layout that’s pretty simple if you stick to artisteer themes and read fingerman;s post. We put a navigation sidebar to the right, sometimes a menu under the header and we always have a content wrapped ad in the top left. 1. Is it everything fine with local monthly searches and Avg. CPC? 2. Will I get this Avg. CPC although most of visitors are from India? Hmmm that’s a very good question actually. What I think is that you are correct, most likely the local searches (assuming you of course correctly selected India) are accurate to India but the avg CPC is probably much lower and probably reflects the avg cpc for in the US. This is assuming of course SOME people advertise for it in the US. You’ll probably have to use your logic here and decide if this is something people in the US would spend CPC on or if it’s only in India (which means the CPC value might be correct for india). Like, when I tried a french site I knew my CPC was correct because it was a french word, noone would advertise for that anywhere else. I dont think anyone can reply to you, it’s more of a gut feeling thing and maybe it will work and maybe not. You won’t know unless you try. Hi, Alex. you mentioned that most of your income comes from 2 sites. are those micro niche with less then 2000..3000 exact searches/month or it’s something bigger with more searches/ month? Alex, you said “I probably target at least 20 keywords of 2-4k+ searches” for your main site.. are these keyword related to your main keyword and are sub keywords,that contains your main keyword inside ? or it’s something related but no root keyword inside? for the sites making <1$ per month, don't you lose a lot of money in just the hosting of the website domain? Bluehost has shared hosting, meaning any website hosted past the first one does not cost you more. Also, the $10 for a domain name is really nothing. The only thing that makes me hesitate to start a new website is if I feel I really get back some $ for the time spent working on it, finding keywords, posting it and creating some initial backlinks for it. Ultimately, I always remember that I succeeded in IM because I tried many things in my first month and I think that’s the reason why a year later I can live off IM and others not (that and I was working 40hours/week during my first 5 months on this). Soooo conclusion is do not worry about the money “lost” in buying a domain, view it as an oppurtunity (I think Dave did a great intro to that in our ultimate internet marketing guide. Thanks for the detailed reply, appreciate it!. Thanks again for the help Alex. Weird that google might ban you for too many low income websites. What if they were a lot of high income? I definitely see your point about the few niche sites, but largely expanded into a large website, which basically is just a bunch of small related niche sites combined into one giant team? Also, have you guys ever used Market Samurai? Ya we both use market samurai, I just did not recommend it on this website because I use it less and less over the past months and at $100+ I don’t see it being that useful. The keyword research is quite slow when you want to check many many keywords and the rank tracker is super slow too. SEO competition analysis is pretty good but it’s much easier to do it with the SEOquake toolbar and just quickly scan the top 5 listings on google. The one thing it’s good at is looking at the anchor text of the backlinks of your competition but since that’s from yahoo data which is becoming weaker and weaker as yahoo is shutting down their service it’s also not that useful soon. How long do you wait before you say to yourself, “this site is not making me $5 per day”…? Do you make that assessment when you are ranked in the top 5 or do you base it off how many visitors you get daily? I have 10 sites that are indexed but not all on page 1 of Google. It’s been a couple months now… One is ranked #6… Should I keep plugging away (adding more content, creating web2.0’s, free blogs, article submissions) until I am ranked in the top 3? I don’t want to get banned. I wouldn’t worry about getting banned unless you start doing massive black hat spam at this point… Anyway, you can work on creating newer sites and more keyword research. It has the advantage of letting your current sites age and when you return to work on them it will be your newer websites turn to age… The only websites I’ve abandoned on are when they shown themselves to make a lot less money then anticipated or that they do not make much money until they reach #1 and that position seems way too hard for the effort it will take. Interesting! Basically you are just letting the site waste away because adsense income is negligible there and it’s better to play it safe and not get banned? Is the mult-tiny-niche adsense website bannage a theory or there is some evidence behind it? Well, I almost never hear of people with a few quality websites getting banned from adsense while I constantly see people with their 50+ websites on adsense accounts getting banned. You might have 50+ and not get banned and they might all be great but in our eyes whats a few dollars when (In dave’s case) you are dealing with 500+ a day? I think we both would rather make sure we never get banned and only have adsense on quality websites than try to get every last $ we can get. Alex your website has a great deal of information and i have been reading it for the past hour some really good stuff here! I was wondering if you ever created a sample layout or have a idea of what a “good” average adsense ctr would be? Right now on my niche site the CTR average is 2.50% traffic is low tho about 80-100 people a day, i am wondering when should i address my adsense CTR should i just keep focusing on rankings and managing about 5 niche sites in total? It really depends on your niches and audience in those markets. I have a website with 1% CTR that I constantly try to improve but it simply does not work… Dave is telling me to put CPA offers on it and forget about adsense. My main website has a 5-6% CTR, and my second highest earner (about $20-30 a day) has a ctr of 10-30% depending on the pages! I’m following a similar model and aiming for a similar amount of passive income so taht I can travel more and work on other stuff. Could I ask you a few questions to give me an idea of how far i’ve got to go? Your big site (60% of your income) – how many articles do you have on that and what level of quality? Do you outsource them and if so for how much per article? How many visitors does your big site get each month to be making that money? Do you add articles constantly or did you just set it up and pretty much leave it? If I leave my site alone and move onto another niche, do you think my earnings will naturally improve with time or should I work on building up this site more? I just added articles over time as I found things to write about. Not sure, depends on your niche but most of the time things just slowly get better even if you do not work on a website. I’m actually thinking about doing the same thing. Wow, thanks for the great reply Alex, really appreciate it. My basic business plan is to get about 20 niche sites up and running based around main keywords of 1000-2000 searches/month. They will have 5 articles each, with the other articles targetting KW’s of about 1000 searches/month. I’ll then watch them to see which ones are making money and start expanding those. I totally agree with what you say above about building a few large sites rather than hundreds of little ones, you’re on much safer ground with google doing it that way and it’s easier to write articles on the same subject as you’ve written them on before. Do you write your articles a certain way to improve your adsense clickthrough rate or is this more about where on the page the ads are placed? Mines are down the side and getting no clickthroughs at all. Ya I write articles that are always keyword focused, every so often I try to find a new list of keywords for my existing websites that I can use for the weeks to come to write on. Fingerman puts 1 adsense in his article which is at the top left of his article. I usually put 2, one at the top and one near the middle end of my article. What do you think of them, would they work? I tried prosense early on… Dunno, it seems pretty ugly to me so I removed it by recommendation of Fingerman who told me to do my themes with artisteer. I feel my themes after were not extremely good looking, but good enough while allowing me great adsense clicks. How many hours per day did you spent to achieve this level? When you are evaluating your niches, what is the minimum adsense CPC you would go for? Would be a trade-off between numbers per month and CPC?? Ya, but ideally I go for at least $1-2, especially initially so theirs more chance people advertise for the keywords you are going for. With time common sense is best to see if a keyword should be used or not.